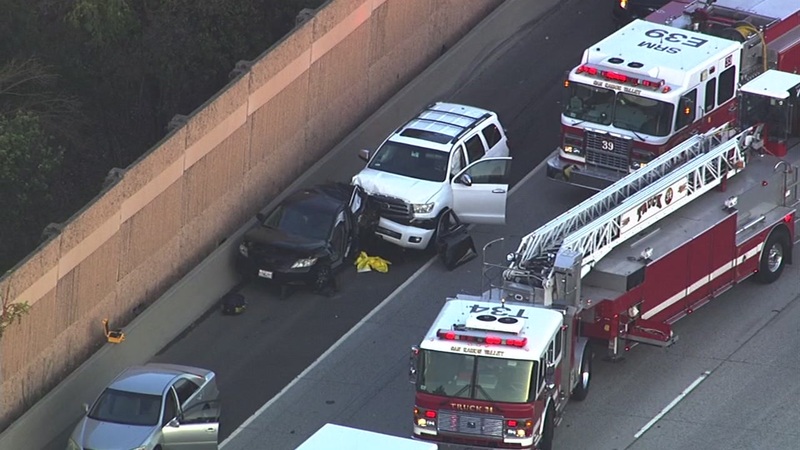 SAN RAMON, Calif. (KGO) -- A child who was rushed to an East Bay hospital has died after a violent crash on Interstate 680 in San Ramon Friday night. Two other kids were rushed to the emergency room on the ground. The crash happened just before 6:30 p.m. when an SUV collided with another vehicle on the northbound lanes near the Bollinger Canyon road exit. The CHP has arrested the driver of the SUV, a woman, for felony DUI. This comes after the family received the devastating news that 3-year-old Elijah Dunn died after being transported to the hospital. Initial reports incorrectly had the boy to be 4 years old. Paramedics airlifted the 3-year-old Dunn after he was pulled from the mangled wreckage of his mother's car. Dunn's grandfather tells ABC7 News the boy was seated in the rear on the driver's side of a Toyota Camry as the family waited alongside I-680 for gas. Dunn's mother, the driver, had pulled over on the right-hand side of the roadway near the Bollinger Canyon road exit. Around 6:20 p.m., the CHP received the call that a white Toyota Sequoia had slammed into the back of the stalled car. Paramedics transported the two other children in the car to Children's Hospital Oakland. Their grandfather says the 12-year-old boy and a nearly 2-year-old girl are okay. The mother is currently being treated at John Muir Medical Center. The family says she has a broken back, ribs, and other severe injuries. The driver of the SUV was also transported for her injuries, but there's no word on her condition. The CHP shut down lanes to investigate and reopened all lanes at 9 p.m.
Reporter Katie Utehs will have a live report on ABC7 News at 11 p.m. Click here to watch live at 11 p.m.